Has your trailer jack turned into a hunk of rusty metal? Your boat's trailer jack is a simple thing. It raises your boat, lowers it and has wheels that allow it to pivot. But when it seizes up or strips its worm gear, it can leave you unable to hook up, unhook or move your trailer. In this article, I will offer advice on how to select the right jack for your boat when it’s time to replace it. West Marine's new trailer jack lineup: 1,000 Pound, 1,200 Pound and 1,500 Pound models. What Is Your Boat’s Environment? Do you use your boat in a freshwater environment or in salt water? How friendly is the climate to a non-stainless-steel product that gets dunked in the water? The general consensus seems to be that they're cheaply put together, last about one season and fail when you least expect it. Rinsing the jack with fresh water and lubing its gears regularly with marine-grade grease seems to help, but there's a lot of angst on the Internet about the humble trailer jack. Is the jack galvanized, zinc, powdercoated or aluminum? If you only launch your boat in fresh water, a powdercoated jack will handle that less-corrosive environment. 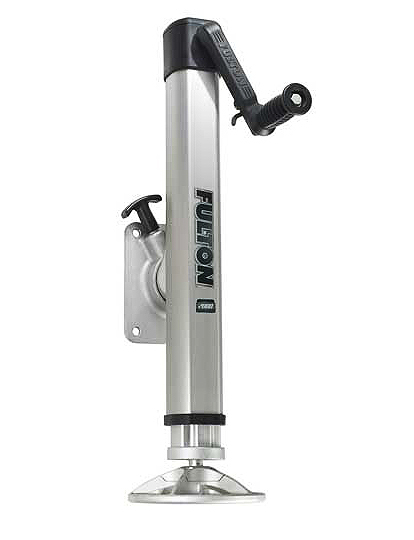 For saltwater use, look for a jack that has a self-healing zinc coating or components made from aluminum (see Fulton's F2 products). Look at how many hours of saltwater exposure the jack is rated to survive. Our new 1,000 pound jack is rated for 100 hours of saltwater exposure to its clear zinc finish. Our 1,200 and 1,500 pound jacks are made with high-performance corrosion and UV-resistant finishes, rated to a more rigorous 600-hour standard. We also back these two models with a full five-year warranty, so we're pretty confident they will perform. How Much Lift Height and Range of Travel Do You Need? There are two measurements to know when choosing a trailer jack, the amount of travel between the up and down position, and the total amount of extension the jack will provide. Smaller jacks have a 10" range of travel. 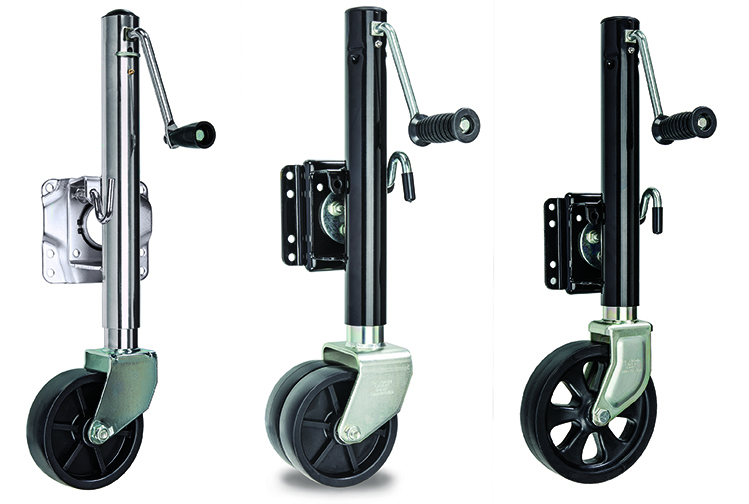 The biggest heavy-duty jacks in our selection have a 15" travel. Measure your trailer and tow vehicle to determine the height you will need. You can also purchase a trailer hitch receiver with a rise or a drop built into it. Read our West Advisor article called Sizing Up Trailer Hitches and Couplers for more on this topic. Will the Jack Fit the Tongue of Your Trailer? As for how the jack attaches to your trailer, there are two styles, bolt-on and weld-on. 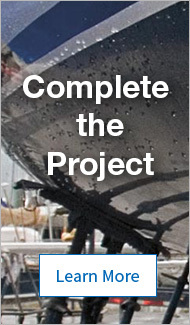 West Marine does not currently offer any weld-on models, which need to be attached by someone with professional welding skills and equipment. The most common size for trailer frames is 4" high and 3" wide. Our bolt-on models and most of the others we sell will fit frames up to 3" wide by 5" tall. This F2 Bolt-On 2000 lb. Trailer Jack is made with aluminum components and includes a big 7" diameter foot plate. Does It Have Enough Lift Capacity to Raise Your Trailer? Do you have any idea what the trailer’s tongue weight is? Typical tongue weights are 10 to 15 percent of the total weight of the boat and trailer. For example, if you have a trailer rig that weighs 10,000 pounds all-up, the tongue weight is likely to be 1,000 to 1,500 pounds. If you do not know the tongue weight of your boat and trailer, we provide a couple of do-it-yourself methods to measure this in our Advisor article, Sizing Up Trailer Hitches and Couplers. Small Single Wheel, Bigger Single Wheel or Double Wheels? One small wheel tends to dig into soft surfaces like gravel and makes pushing bigger, heavier trailers really hard. Our 1,500-pound jack uses a large, 8" wheel. Upgrading to double wheels, found on our 1,200-pound jack, also helps. This made a huge difference in my ability to move a 1,800 pound 21' boat around by myself. Upgrading to the dual-wheel F2 jack was a dramatic improvement, and one of the best upgrades I’ve made. Would a Jack With a Foot Work Better? You might consider a jack with a rectangular pad on the bottom instead of a wheel, a drop-leg jack, if your boat is big and heavy enough so you never push it around manually. We offer both pivoting models and those that don't pivot, but just extend downward.